Isiah Factor | The Insite » ODD SIGHTING OF THE WEEK! ODD SIGHTING OF THE WEEK! July 15, 2008 | Posted in Uncategorized | Comments Off on ODD SIGHTING OF THE WEEK! 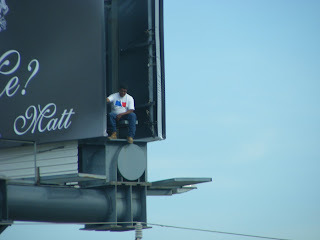 GIVE A GOOD GUESS: WHAT WAS THIS GUY DOING HANGING OUT ON THIS BILLBOARD! I was driving by the George R. Brown Convention center last week when I noticed a man just hanging out. 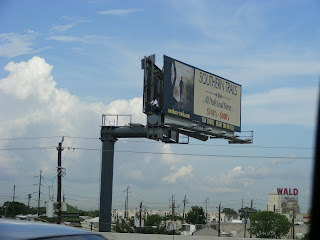 He was hanging out on a 50 foot high (height estimate is very questionable) billboard. I searched the ground area to see if he was with a crew or if there was a ladder. There was none of the above. I think he may have just crawled up there to watch the 5pm traffic on highway 59. The Insite is challenging you to guess what you think think guy is doing just sitting up on a billboard. I’m looking for the most creative guess!